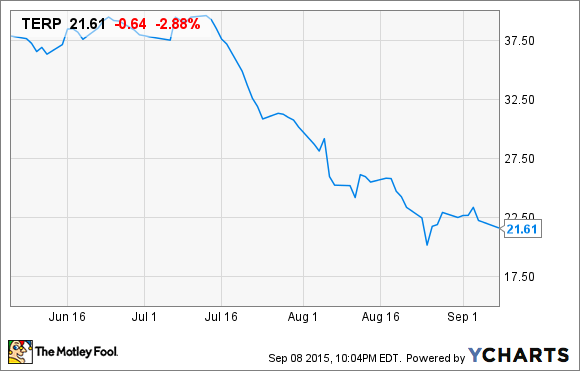 Is It Time for SunEdison to Break Up With Vivint Solar? The merger of these two solar giants may not be as great as it once appeared. Large solar projects are really SunEdison's bread and butter. Image: SunEdison. It's not often that a merger between two companies goes from mutually beneficial to mutually destructive in just a couple of months' time, but that may be the case with SunEdison's (NASDAQOTH:SUNEQ) buyout of Vivint Solar (NYSE:VSLR). Not only has SunEdison's falling stock price made the deal less valuable for Vivint Solar, it's actually made it harder to execute on the plans that made the deal attractive in the first place. Here's why both sides should walk away right now. The thesis behind the merger used to make a lot of sense. Vivint Solar would fold into SunEdison's much larger operations, which would give SunEdison more opportunities to expand its solar footprint and provide Vivint with new sources of capital. The main source of capital was to be TerraForm Power (NASDAQ:TERP), SunEdison's yieldco, which buys projects and operates them long-term. The yieldco was supposed to buy $922 million of Vivint Solar projects after the deal closed and continue buying projects in perpetuity. But that's not playing out as planned. Yieldcos are predicated on the idea that they'll be able to issue debt and new stock at low costs of capital (high prices) forever. The projects they buy will have higher returns than the debt and equity they issue, meaning every new acquisition is accretive (or adds to earnings and dividends). That's the theory, explained in more detail here. But TerraForm Power's stock is down nearly 50% in the past three months, meaning issuing new equity is more expensive. And debt costs have been rising for SunEdison in general as well. On top of that, TerraForm Power doesn't exactly have $922 million of cash laying around to complete the acquisition. It had $391 million in cash at the end of the second quarter, and SunEdison is counting on some of that money to buy its solar developments. The simple fact that SunEdison's stock has plummeted since the acquisition was announced should be enough for Vivint Solar to want out. The announced acquisition price of $16.50 per share included $9.89 per share in cash, $3.31 per share in SunEdison stock, and $3.30 per share in SunEdison convertible notes. Obviously, the SunEdison stock has lost 60% of its value since then, making the deal less attractive, but the convertible notes can't convert at less than $27.51 per share, meaning they're basically just a 2.25% interest note at this point. That's not very attractive as interest rates rise. Without access to low cost capital from TerraForm Power, which is in real question, this buyout isn't all that attractive to Vivint Solar's operations, and certainly isn't a great deal for shareholders today. I think its leaders should want out, and soon. With $10.7 billion in debt, including what's consolidated from subsidiaries, SunEdison simply doesn't have the capital to build out its 8.1 GW pipeline. That's why it launched TerraForm Power and TerraForm Global, which will both own projects purchased from SunEdison. But as I highlighted above, their falling stock prices make it harder to buy projects at attractive prices. Without this form of funding it's harder to justify buying Vivint Solar. One alternative SunEdison is rapidly developing is what it calls warehouse facilities. These are funds that own projects until TerraForm Power is able to buy them. They could simply own projects forever if TerraForm Power isn't able to raise the funds needed to buy all of the projects in the pipeline. 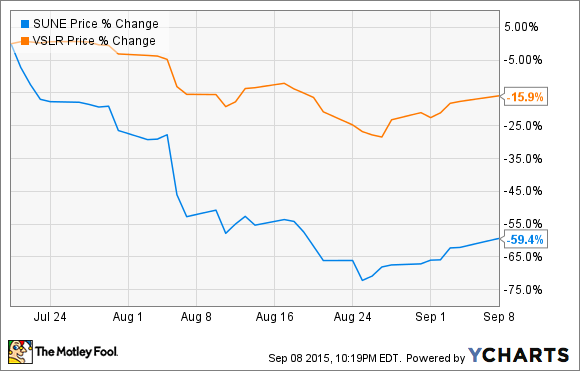 This is where prioritization becomes very important for SunEdison. It has already acquired two wind developers this year and has a large backlog of its own. Vivint Solar only adds to the funding needs going forward, funding that isn't currently available outside of high cost warehouse facilities. I think what SunEdison needs to do is prioritize its own projects and abandon this acquisition, because it's too much to swallow all at once. The market may not have valued Vivint Solar the way owners wanted it to prior to its acquisition by SunEdison, which is why an alternative to being public was attractive. But that justification doesn't really hold now that SunEdison's stock has plummeted. On SunEdison's side, there's such a thing as too much growth, and with the market questioning how the company can afford to build all of the projects it has in the pipeline it's time to focus on how it can grow organically. It's not often that calling off an acquisition is good for both parties, but in the case of SunEdison and Vivint Solar I think both would be better off going it alone.